Below we have a full collection of Disc Brakes from both Kodiak Trailer Components and Deemax Components. Their are many options for Boaters needing Hydraulic Disc Brakes, whether your using these on your 5 Lug, 6 Lug, or 8 Lug Trailer Wheels. There are several Variations of both Brake Kits, some with Hubs, some Slip On Style, and some Integral style. Both Have Coated Materials and Stainless Steel Components for Maximum Corrosion resistance. We also have Complete All Stainless Steel Kits available. Start By Selecting the Brand of Disc Brake you would prefer. 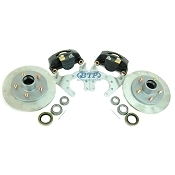 These are complete disc brake kits that will mount on your trailer axles brake flange. The Brake Flange is a piece of Steel that has already been welded to the beam of the trailer axle. Their will be either 4 Holes or 5 Holes depending upon the capacity of the axle itself. Typically Axles with a 4 Hole Flange would be a 3,500lb trailer axle with 5 Lug wheels. Typically Axles with a 5 Hole Flange would be either a 5,200lb Axle with 6 Lug wheels, or a 6,000lb-7,000lb Axle with 8 Lug Wheels.